Kathryn Smith is no braggart. She's focused on her work and shuns the spotlight. In fact, she's hesitant to acknowledge the history she has made and the proverbial glass ceiling she has shattered. But at just 32 years old, she has already broken through in the male-dominated National Football League, becoming the first woman to become a full-time assistant coach for the league. "It's crazy. It really is," Smith says in CNN's latest Boss Files with Poppy Harlow podcast. "You don't set out to be a trailblazer, and I didn't know that that's where my path was going to lead me." 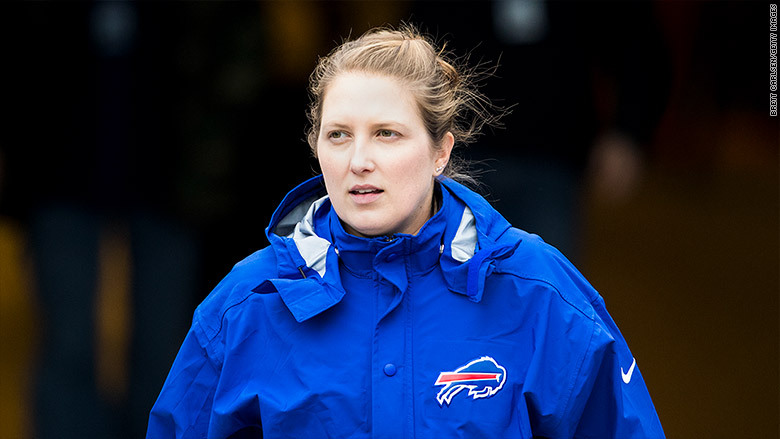 During the 2016-2017 season, she served as Special Teams Quality Control Coach for the Buffalo Bills, preparing game plans and playbooks for the team. Often the only woman in the room during coach or player meetings, Smith notes, "It's interesting because with the players there wasn't a lot of focus... on gender at all." As a kid, Smith helped her father on the sidelines as he coached high school football. "The sky is the limit. She's pretty tough. She's always going forward, never going backward," her father Robert Smith, told The Fordham Observer during an August 2016 interview about his daughter's work ethic. Smith was brought to tears hearing her father's words read to her. "I didn't know he said that... I'm really close with my dad, and he was just always so supportive." Both her parents told her and her brother they could accomplish the same things, equally, regardless of their gender. And that's exactly how Smith says her fellow coaches and players treated her -- as an equal. 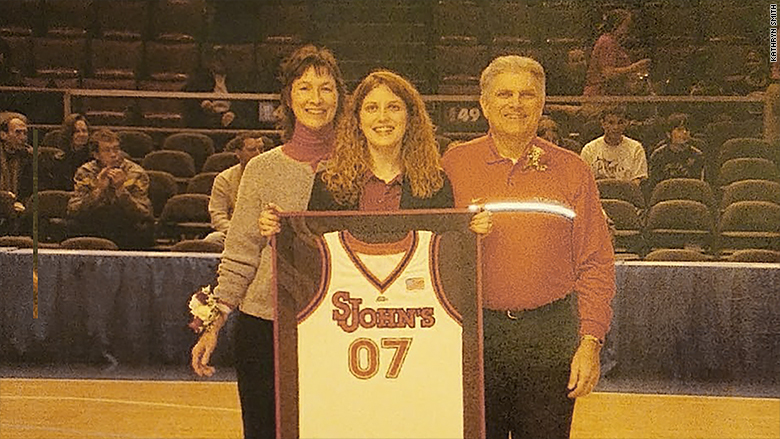 Kathryn Smith with her parents at St. John's University. "The players want to win, they want to play, they want to be their best. So, to them, if they feel that you're someone that can help them, they embrace it," she says. But fans weren't always as decent. Last season, a fan who was rooting for the opposing team yelled down at Smith while she was coaching on the sidelines, "Hey waitress! Can I have a Pepsi, please?" A video of the incident, which later went viral, shows Smith walking away from the man without acknowledging him. Smith says she didn't hear him at the time, but a woman standing next to the fan put him in check for his crass remark. Related: Facebook exec says: "We need more women in power"
Smith responds now saying, "It was classless, and there are classless people in all walks of life. Like I said, hopefully you learn from it, and hopefully he realized that was not an appropriate thing to say. I think that's the best you can do is hope that people learn from it." Smith calls former Buffalo Bills head coach Rex Ryan her biggest professional champion. Ryan hired Smith at the Bills. But he couldn't turn around the team's long-running playoff drought quickly enough and was dismissed. Smith left soon afterward. Smith also received encouragement from one of the team's owners, Kim Pegula, who texted her when it was announced that she'd become a full-time coach. "Don't let it be about being a female," Pegula's text read. "Do the best job you can. Show them through doing a great job that you deserve to be in this spot." "That was huge," Smith says. Smith on the field with the Buffalo Bills. Smith may have been the first to join the ranks of full-time female NFL coaches -- but she has since been joined by Katie Sowers of the San Francisco 49ers, who became the second woman to be hired as a full-time assistant coach in August 2017. In 2015, Jen Welter coached with the Arizona Cardinals' inside linebackers during training camp and the preseason. That same year, Sarah Thomas became the NFL's first female official and she became a line judge that season. "I hope it's leading to, honestly, to it not being a conversation," Smith says. "I hope that it just becomes, 'This is the next coach of this team,' but that's the announcement, not that 'It's a female coach.'" Smith says it's important to remind people that she's not the only woman working in the league. "I think externally, people don't realize I'm not the only woman that these players came in contact with on a daily basis," Smith tells Harlow. "There's a lot of women that do a lot of different jobs. So it's not as odd among teams as I think people that aren't as familiar with the teams and the league, perhaps, realize." It took years of hard work for Smith to get to this point. 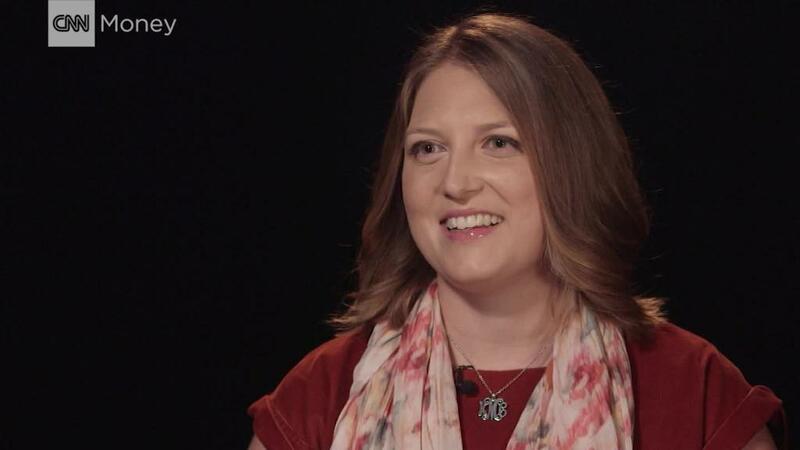 She started with the NFL as an intern for the New York Jets while in college studying sports management, and was later hired full-time as a player personal assistant. Her rise has been meteoric by any measure -- but her ego has not inflated one ounce on the way up. Her coaching career in the NFL, she maintains, has only begun. As next season approaches, Smith is laser focused on landing at another NFL team doing what she knows, and loves, best. Coaching. Perhaps as a head coach one day. "That would be amazing," Smith says.